On July 31, 2002 Tamara Brooks, then sixteen years old, and Jaci Maris, were kidnapped from Quartz Hill, California. The local Sheriff's Department issued California's first Amber Alert which mobilized and united 13 government agencies in an intense effort to locate the girls. The alert was successful. The girls returned to the safety of their families but the story did not end there. On October 2, 2002 the President hosted the first White House Conference on Missing, Exploited and Runaway Children. Experts and surviving families from across America convened to share and rally around best practices for making America safer for all children. Sharon Brooks emerged as a vocal advocate for children and the passage of the federal Amber Alert law. As a mother of four children and an educator Sharon has always been keenly aware of the need to keep children safe. But the kidnapping and assault of her daughter in 2002 made her cognizant of the fact that our nation needs far more than child safety education. 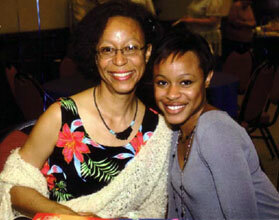 Both Sharon and Tamara have become renowned speakers on the importance and effectiveness of the Amber Alert program. Each, in their own right, speak at conferences of law enforcement personnel sharing their experiences so that officers will be more conscientious about the experiences of victims and their families. Sharon is a passionate advocate for victim and surviving family counseling so that they can begin the healing process. She is an equally passionate advocate for legislation that will bring criminals who commit crimes against children to justice and keep them off the streets. Sharon shares her story, time and efforts in this arena in the hope that one day our nation will not need to issue any Amber Alerts and that children will be safe.